One of the problems of return projections in the financial industry is that most of the math is modeled on a straight line. For example, the math on a 7% average return really assumes that you make 7% per year each and every year. If you think about it, the rate of return is really the slope between 2 points – a start point and an end point. If you had a 9% return, the slope would be steeper. If you had a 5% return, the line would be flatter. If you had $100,000 and you took out $9000 per year (assuming no inflation and a 7% average return), the math on a straight line would say that you would run out of money in 20 years. The problem, of course, is the investment portfolio never moves in a straight line. It moves with peaks and valleys and every now and then it crosses the straight line. Would the outcome be different if the math was done using the black line instead of the red line? Let’s take a look. Let’s assume a set of hypothetical, variable returns over a 25 year period where retirement starts in a bull market with some positive returns right off the bat. As you can see from the chart, the sequence of returns averages out to the same 7%. The start point and the end point are the same but it just takes a different path to get there. 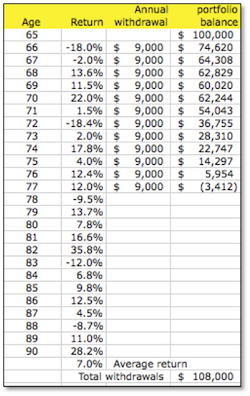 This sequence of returns allows the money to last the entire 25 year period and still have some money left at the end. 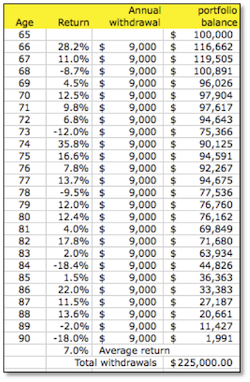 This sequence of returns has the $100,000 lasting more than 5 years longer largely because a couple of strong returns in the first couple of years extends the longevity of the portfolio. If a couple of good years has a positive effect on the longevity of the portfolio, do you think a couple of bad years might affect it too? In this next set of numbers, we look at variable returns but we reverse the order of returns so instead of starting with a couple of good years, we start with a couple of bad years. Remember, because the returns are exactly the same, the average return does not change. Now, with the case of bad timing, the portfolio only lasts 12 years, which is 13 years earlier than if the portfolio started with good years. That’s a huge difference in results. As you can see, success is clearly a case of timing. Will You Retire in Good Times or in Bad Times? Although this example is hypothetical, the experience is real. Do you know people who have delayed retirement because of the stock market? Do you know people that have retired but gone back to work because of what the stock market has done to their portfolio? Do you know people who have cut back on their lifestyle in retirement which is supposed to be the golden years because of drops in their portfolios? This has happened far too often and the lesson is simple. As you get closer to retirement, you need to re-evaluate your portfolios and make them more conservative. Part of your portfolio needs to be guaranteed and not exposed to the variable, unpredictable returns of the stock market. I’ve played with these numbers a lot and the end result is always the same. The more risk and variability you have in the portfolio, the bigger the disparity of outcome. The higher the withdrawal rate, the bigger the risk of running out of money. 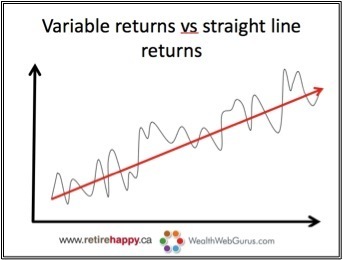 Variable returns can work against you. The market risk that is supposed to reward you can sometimes work against you especially in retirement when you are drawing an income from your investments. The math is real so remember that investing IN retirement is very different than investing FOR retirement. While I do have some ETFs I will move over to dividend stocks as we retire, than stock market crashed won’t matter.